Snapchat popularized the idea of sharing moments from your day with specific followers or all of them with a feature called ‘Stories.’ This feature became extremely popular and was aped by rivals such as Instagram, Facebook, WhatsApp and even YouTube. And now, in an effort to take this feature beyond just the app, Snapchat appears to be testing a way to let users share their stories on other apps and even the web. According to a report from online news channel Cheddar, Snapchat is developing a new feature called “Stories Everywhere” to push content outside the app and into the broader web ecosystem. Reportedly, Snapchat is said to be inspired by Twitter when the company allowed content publishers to embed tweets in posts and blog articles. In case you don’t know, you can copy the embed code of a tweet and publish it in your articles on your website or blog. So you may soon be able to embed Snapchat stories in blog posts and such. At the moment, though, it’s not entirely clear how this will work with Snapchat. However the basic objective is simple. Essentially, the more you see Snapchat’s content online, the more likely you might be to use Snapchat or at least watch its content online. It is also worth noting that Snapchat would be the first one to introduce this since both Facebook and Instagram don’t offer embedded versions of their Stories offerings just yet. How much of an advantage it proves remains to be seen. The source also notes that Snap has hired Rahul Chopra, the former VP and global head of video at News Corp. to help them expand stories. In other news, Snapchat has also introduced “Your 2017 Story .” It is quite similar to Facebook’s Year in Review video that gives you a rundown of your activities in 2017. 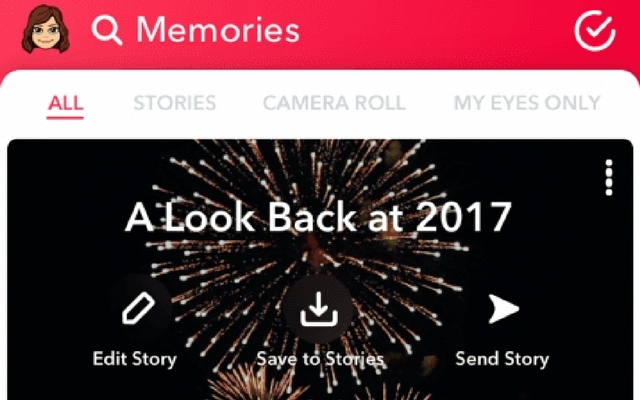 Instead of status updates and posts, Snapchat will select your saved memories throughout 2017 and packages into a unique story. This story can also be saved and shared with your friends on the platform. Simply head over to memories by tapping the icon. Once you’re there, look for “A Look Back at 2017” option under ‘All’ tab. You can directly share the generated story, or you can also edit it to remove a couple of stories if you don’t feel like sharing them. That being said, we’d like to know your thoughts on this. Do you think the new “Stories everywhere” feature would allow Snapchat to expand their userbase? Let us know your thoughts on this by dropping a comment down below.